Christians are slowly getting out of their stereotyped pigeon hole of being right-wing supporters of the status quo and are being recognized for fervent work on global justice. Diana forwarded me this recent Nicholas Kristof piece called "Learning from the Sin of Sodom," mentioning World Vision as the largest U.S. based international relief and development organization and calling for more cooperation among liberals and evangelicals (and everyone in between) to bring about justice. Although this is a small step of recognizing Christian organizations' work, it's an important one that builds bridges rather than points fingers. Steps have also been made on our campus. Last month, a bunch of fellowships on campus - lead by Jesus for Justice (J^2) - banded together to continue campus awareness about Haiti's needs and raise money for sustained relief. In total, we raised an awesome $1033.50 donated to World Vision and Partners in Health, resulting from collections of loose change and private donations. The photo above is sadly not of the massive number of coins we collected, but you get the idea. These were heavy to lug to the bank, though, and were mainly counted in Jasmine's dorm. 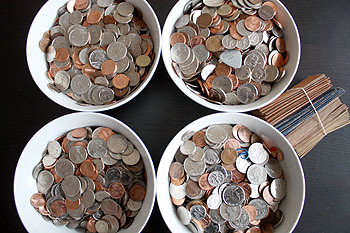 According to this site on coin distribution, a pound of coins amounts to about $12.96, although I feel like ours was a bit less, since people have a tendency to donate dimes, nickels, and pennies while saving their quarters for laundry or meters. In any rate, this collection was super encouraging and challenged my notions about provision, and how faithfulness in the small things can multiply into big change (pun intended). It also reminded me to remember those with little or nothing and who could be helped by our abundance.